Director – Roger Christian, Screenplay – Corey Mandell & J.D. Shapiro, Based on the Novel by L. Ron Hubbard, Producers – Jonathan D. Krane, Elie Samaha & John Travolta, Photography – Giles Nuttgens, Music – Elia Cmiral, Visual Effects Supervisor – Erik Henry, Creature Effects – Patrick Tatopoulos Design (Supervisor – Patrick Tatopoulos), Visual Effects – The Computer Café, Digital Backlot, Digital Firepower Inc, Digital Muse, Gray Matter FX, Hybride Technologies (Supervisor – Danielle Leduc), Image Savant, Optical Illusions Inc, Rhythm and Hues (Supervisors – Bryan Hirata & Nicholas Titmarsh) & 3D Site, Miniature Supervisor – Bill Peerson, Mechanical Effects – Productions de L’Intrigue (Supervisor – Louis Craig), Production Design – Tatopolous. Production Company – Morgan Creek/Franchise Pictures/JTP Films. It is the year 3000. Earth has been invaded by the brutal Psychlos and humanity reduced to a slave species that the Psychlos regard as no more intelligent than animals. Terl, the Psychlo security supervisor, is sentenced to several more terms of service on Earth because of an indiscretion. The discovery of a vein of gold proves Terl’s hope and he launches a devious plan to mine it that involves teaching several of the man-animals how to use mining equipment. Terl puts the persistent escapee Jonnie Goodboy Tyler through a Psychlo education machine so that Jonnie can learn equipment use. As Jonnie starts to learn mathematics and the Psychlo language, he also learns about Earth’s history and starts to plot ways to rally humanity and reclaim Earth from the invaders. It is difficult to write an objective review of Battlefield Earth: A Saga of the Year 3000. The reason for this is due to one credit on the film that created an enormous amount of controversy when it came out – namely ‘Based on a Novel by L. Ron Hubbard’. Lafayette Ronald Hubbard (1911-86) was a writer who wrote a good amount of science-fiction and fantasy during the 1940s. L. Ron Hubbard’s main claim to fame – at least, one of the numerous ones he didn’t make up about himself such as being an explorer; a blood brother of the Blackfoot Indians; that he traveled in Asia and met with holy men during his teens; that he had degrees in engineering and mathematics; that he was a nuclear physicist; that he was a decorated Admiral in the US Navy who fought in five theatres of war during World War II, received over twenty medals and made a miraculous recovery from blindness and paralysis following injuries sustained in combat; and that he had written a novel called Excalibur, which was so horrifying that it had to be kept in a bank vault as it had killed everybody who had ever read it – was the publication of a non-fiction book of psychology called Dianetics (1950). In 1955, following a savage condemnation by the American Psychological Association who claimed that Hubbard had invented the statistics used in his book, as well as debts incurred by financial mismanagement, Hubbard was forced to stop claiming that Dianetics was a medical science. Hubbard’s ingenious solution was to reinvent Dianetics as a religion – namely the Church of Scientology. The essence of Dianetics/Scientology teaches that via a process known as auditing (conducted using a device known as the E-meter, which is little more than a lie detector) people could rid themselves of engrams. Engrams are behavioural imprints that lead to psychological compulsions and are the root of most forms of poor health. Once one is freed of engrams, they become a Clear and can develop a high IQ, total memory recall, even the ability to mentally manipulate matter. Auditing can also cure blindness, cancer, leukaemia and the cold, Hubbard claimed. In the most secret of all Scientology texts – something you may pay tens of thousands of dollars to discover and which the Scientologists have fought vicious court battles in Denmark and Sweden to stop being placed into public domain and later published on the internet (Warning:– If you are a non-Clear, this knowledge will cause you to become sick and die within a few days of reading this) – devotees learn that engrams are the negative detritus of reincarnated past lives and that as a result of an intergalactic war trillions of years ago, spirit bodies referred to as Thetans were deposited on Earth (or Teegeeack) as a result of a war with an intergalactic dictator known as Zenu who is imprisoned in a volcano. This in itself is not bad – there have been nutty religions before. What gives Scientology its bad rap is some of the reported tactics employed by the Church against critics, including conducting smear campaigns and blackmail using personal information recorded in auditing sessions, criminal framings, nuisance lawsuits, fire-bombing the houses of ex-members who have spoken out against Scientology, even the theft of Interpol files on critics. In the 1980s, eleven members of the church, including L. Ron Hubbard’s wife, were criminally indicted for trying to steal files held against them from FBI and other government offices. Critics of Scientology have tended to label L. Ron Hubbard as a bad science-fiction writer, using the terms ‘bad’ and ‘science-fiction’ as though they were fairly much synonymous. This is however inaccurate. Firstly, in that L. Ron Hubbard did not strictly write science-fiction – he was simply a pulp writer and also churned out Westerns, horror, fantasy and detective thrillers. Secondly, his science-fiction was published in Astounding under editor John W. Campbell, a magazine that is regarded by genre historians as the single most sophisticated and important science-fiction magazine of the 1940s. And thirdly, while L. Ron Hubbard’s prose was crude and lacked any subtlety, there are occasional stories that shone with some imagination – most notably Typewriter in the Sky (1940) about a man trapped in a pirate story his best friend is writing, and Fear (1940), a wonderfully paranoid horror novel about a man trying to find four hours of his memory that have been stolen by a demon. The novel Battlefield Earth (1982) emerged with considerable surprise when it came out – Hubbard had abandoned writing years before for church matters and this was his first return to fiction writing in 40 years. This was followed by a ten-volume series, the Mission Earth books, which continued to be written by Hubbard despite his death in 1986. Whether Hubbard is the author of the novels or not is a subject that has been much debated. Are we to believe that Hubbard spent the last years of his life on a yacht Hubbard called Sea-Org while being tended by young maidens and subjecting recruits to experiments in sensory deprivation, writing a space opera saga? So far, nobody has come forward to claim authorship, although that could just be because of fears of Church reprisals. However, taking the claims of Hubbard’s authorship at face-value, the books are terrible. They are written in an atrocious pulp style with a crude, red-blooded jingoism – it is as though Hubbard learned nothing in forty years absence from the writing field. 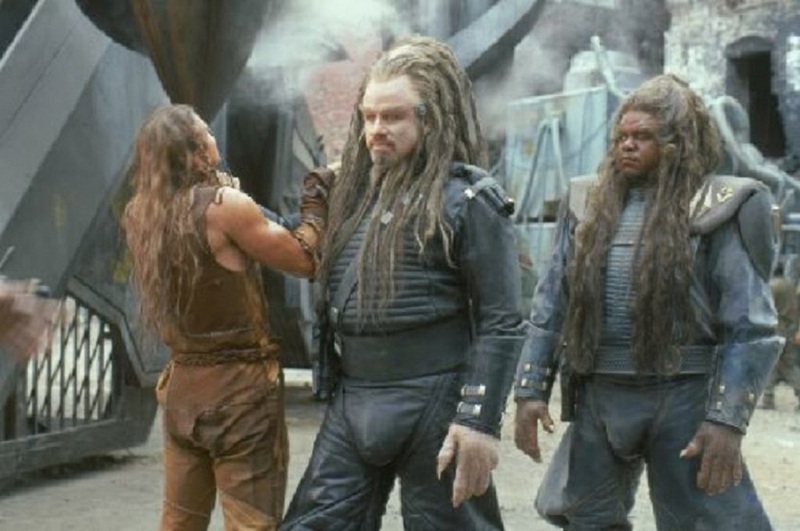 This film version of Battlefield Earth was greeted with a storm of universally negative reviews, including its winning that year’s Golden Raspberry Award. The problem is that most critics tended to review it as a Scientology film rather than a science fiction film. One critic hysterically accused the Scientologists of hiding subliminal messages inside the film in a scene where hero Barry Pepper is placed inside an education machine and the camera briefly shows his point of view and a stream of psychedelic effects comes at the audience. One’s sympathies could not help but be with the Church on this one when they aptly responded: “This is just a film. It’s propaganda for Scientology as much as Gladiator (2000) [released the same week as Battlefield Earth] is propaganda for Christianity.” On the other hand, the Church did not exactly fail to use the occasion of the film’s release as an opportunity for self-promotion, with star John Travolta, one of the most famous of all Scientology’s celebrity recruits, conducting a promotional tour signing copies of the book. It is not as though Russell Crowe promoted Gladiator by signing copies of The Bible. One suspected that in between the hysteria and grandstanding of opinion on both sides, there was probably a mediocre or even a possibly good film that was being dragged down because of its association with the L. Ron Hubbard name. Certainly, Battlefield Earth had a fair director in Roger Christian. Christian began as a set decorator and art director on Star Wars (1977) and Alien (1979). Christian debuted as director with the excellent but little-seen psi-powers film The Sender (1982) and followed with the juvenile space opera Lorca and the Outlaw (1985) and the historical Nostradamus (1994). Outside the genre, Christian has made a series of little seen and poorly regarded thrillers – The Final Cut (1995), Underworld (1997) and Masterminds (1997). Battlefield Earth seemed to sink Roger Christian’s career and it was several years before he returned to the director’s chair with the largely unseen American Daylight (2004) and Bandido (2004), before returning to genre material with Prisoners of the Sun (2013) and Stranded (2013). 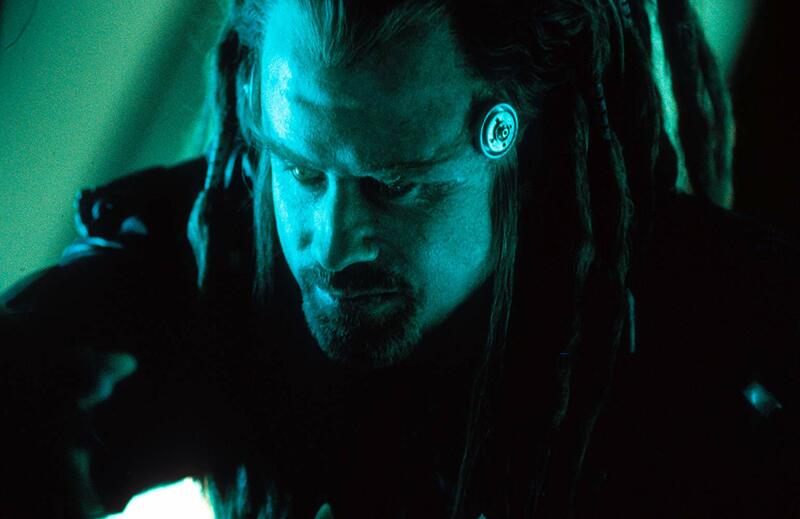 Even though Battlefield Earth was an atrocious book, one had hopes for the film – after all some science-fiction makes for better filmic interpretation than it does literary material. One, for example, tends to think that Star Wars would only ever make a mediocre work had it been published as a book. Sadly to report, Battlefield Earth: A Saga of the Year 3000 is a terrible film – and for reasons that have absolutely nothing to do with Scientology. To accuse it of being propaganda is to ennoble something too moronic to even know how terrible it is being. It is almost as though someone involved in the production had decided to take the Scientologists for a ride and deliberately make the worst film possible with the intention of making them a laughing stock. The film opens promisingly with some good images of ruined cities and the primitive humans trying to explain what they see – statues seen as being people that were frozen as punishment by the gods, rusted cars as fabulous chariots that the ancients rode in – and some worthwhile shootout scenes with shadowy, unseen pursuers, followed by a journey through vast, alien cityscapes. However, the film crashes the moment that John Travolta enters the scene. The film’s bad luck is to start with some of its worst written scenes in the Psychlo bar. The Psychlos are like Klingons with platform heels and dreadlocks but in conception are no more imaginative than simply being interstellar mobsters with green eyes. Travolta plays the part to excess in eye-rolling sotto voce – the effect unintentionally comes out like he is playing something between a caricatured gay man and a Mafioso. It is a nosedive that Battlefield Earth never recovers from. If anything, the film suffers from too much faithfulness to L. Ron Hubbard’s thousand page plus book, as though people did not want to leave any precious word untouched – and as a result the film hails in at a long two hours and soon degenerates into a tiresome murk of subplots over Psychlo infighting and betrayals. The film also quickly heads down the road that all bad science-fiction films with exaggerated pretensions suffer from – ardent flag-waving American patriotism. The first work that the newly re-educated Jonnie picks up happens to be the Declaration of Independence and there are horrid lectures about fighting for freedom and rights. 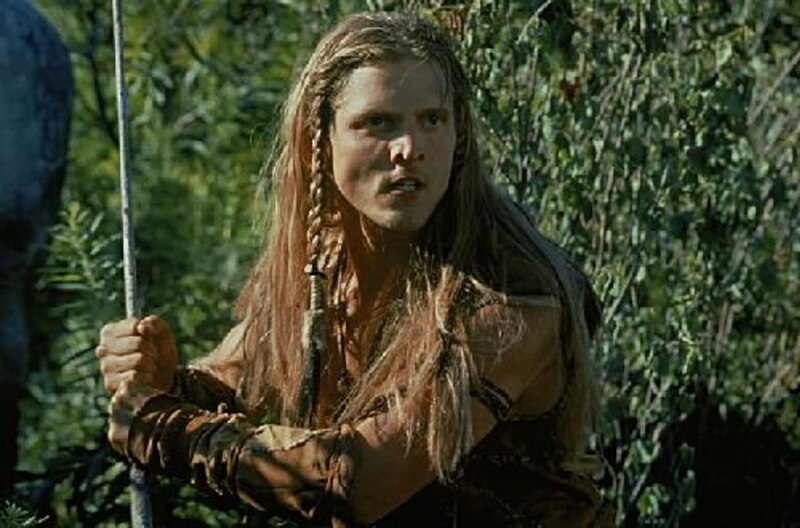 These in themselves may not have been too bad had they not been uttered by hero Barry Pepper whose bland handsomeness fails completely to inflate the role of Jonnie to the necessary heroic stature, indeed barely even makes a distinction on the film. Battlefield Earth climaxes on what surely must be the most laughably unconvincing plot to defeat alien invaders ever hatched – the newly educated humans are sent to mine the vein of gold but instead Jonnie outwits John Travolta’s villain by hatching a scheme to take the gold from Fort Knox (which has conveniently been left unlocked for a thousand years) and present it to Travolta, explaining its being processed bullion away as something they did because they were bored; to then train illiterate primitives to fly old fighter planes (still in perfect working order after a thousand years abandonment) and become crack fighter pilots within the space of seven days; and then, along with primitive prisoners armed only with clubs and stones, lead an attack back against the alien invaders. It is not often that you get to see a film unfolding before your eyes in such spectacularly awful glory. The saddest person to come out of it is John Travolta. Travolta had such an admiration of L. Ron Hubbard that he personally shepherded the production in as producer. It was only a few years ago that John Travolta seemed another teen idol has-been, making ends meet through the likes of Look Who’s Talking sequels. However, in one of the most remarkable career comebacks ever staged, Quentin Tarantino’s canny casting of him in Pulp Fiction (1994), Travolta’s career was entirely revitalised. A number of well-chosen parts balancing serious, dramatic roles in the high-profile likes of Get Shorty (1995), Primary Colors (1998), The Thin Red Line (1998) and A Civil Action (1998), as well as action films like Broken Arrow (1995), Face/Off (1997) and throwaway fluff like Michael (1996) and Phenomenon (1996), quickly propelled Travolta into the exclusive $20 million per picture club. The calibre of Travolta’s performances in these films has shown him as a capable, intelligent and savvy actor. You just wondered where his judgment vanished to here – was he so blinded by religious fervour that he couldn’t see? It is sad to see the great fall – but when they do, they certainly plummet. Certainly, following Battlefield Earth, Travolta’s career of the 00s has never recovered as witness lame ill-advised fare such as Swordfish (2001), Be Cool (2005), Hairspray (2007), Wild Hogs (2007) and Gotti (2018). A fictionalised account in part of the life of L. Ron Hubbard can be found in Paul Thomas Anderson’s The Master (2012). (Winner in this site’s Worst Films of 2000 list).